Today was huge. It started, really, yesterday. 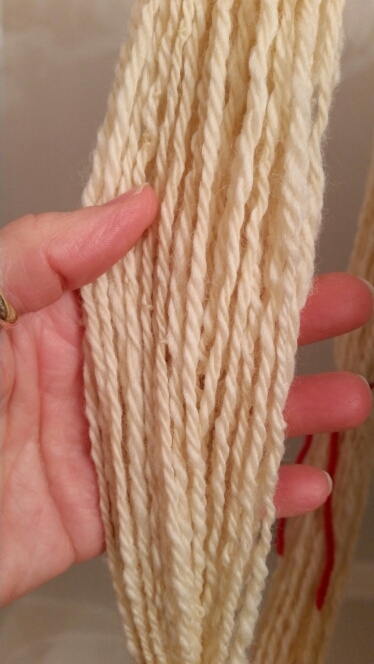 I was not very happy with the way the 3-ply Blue Leicester came out, and I realized that I had allowed myself to become emotionally invested in something I’m still really new at, and in this case something I had never tried before (plying with the Lazy Kate). Not good – this is supposed to be fun, and I’m supposed to be playing. Mistakes are part of it, and are GOOD because they are opportunities to learn. Mistakes mean I’m trying something new. So. I realized that if I’m going to get better at plying, I need to do it more often. In particular, this method of 3-ply using the kate means I have to spin onto three bobbins. If I’m going to do that MORE, then it would be smart to do smaller quantities (doh!) so I can PLY them more often. So really, I think spinning about a half-ounce of wool onto each bobbin would be a good quantity. 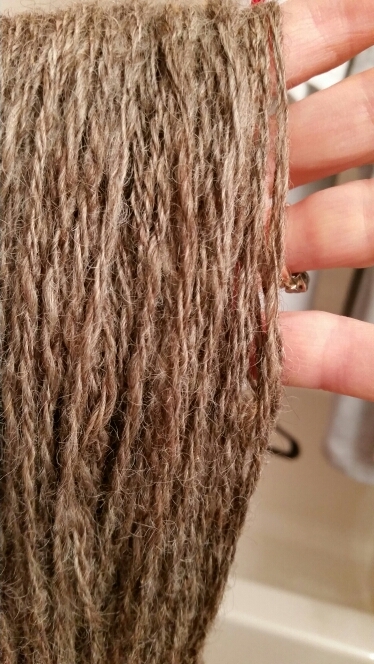 Of course, by the time I had this flash of brilliance I had already spun an ounce of the new wool H57. So last night and today I spun another ounce each onto two more bobbins and then plied them with the kate. Having learned from many of yesterday’s mistakes, I did much better, and actually made a couple of NEW mistakes! Hooray! I’m actually pretty pleased with it. It’s a really pretty cream color. Then I turned my attention back to yesterday’s work, the last of the BL. The biggest problem was that it was unevenly twisted – some parts looked OK, others were really hardly twisted at all. So I used a technique I read about on the web – I put the yarn on my swift, and fed it back through the plying process, just letting it twist a bit more and spool onto the bobbin. And you know what? It worked! Because I wasn’t really putting any tension on it, the OK parts stayed OK, and the untwisted parts got twisted. And it was still balanced (i.e. the skein did not twist when I held it up). So that’s a great thing to know about.